GBPUSD upside momentum halted during Thursday trading session and now looks to weaken further. That leaves immediate support at 1.3050 level. Further down, support comes in at the 1.3000 level where a break will turn focus to the 1.2950 level. Further down, support comes in at the 1.2900 level. Below here will set the stage for more weakness towards the 1.2850 level. On the upside, resistance stands at the 1.3150 with a turn above here allowing for additional strength to build up towards the 1.3200 level. 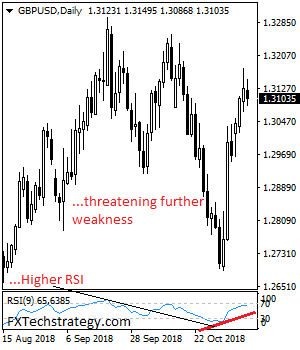 Further out, resistance stands at the 1.3250 level followed by the 1.3300 level. On the whole, GBPUSD faces further pullback threats.